How To Stop The Crazy Cycle! The only thing worse than a horrible argument with your spouse is having it a second time! Unless you approach arguments in a different way, you’re going to have the same results as in the past. 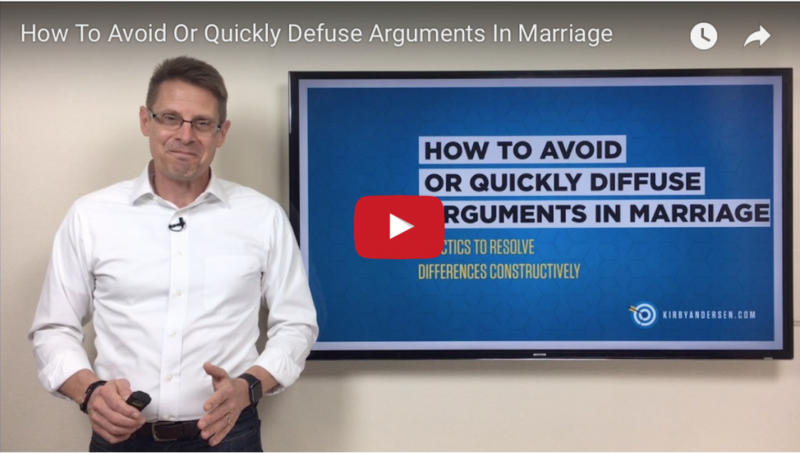 That’s the focus of this week’s video and blog post: How To Avoid Or Quickly Diffuse Arguments In Marriage. Learn a 3-part practical strategy from a simple Bible verse. Use these tactics to not only avoid destructive arguments in the future, but also undo the unresolved hurt of past arguments. Click here to watch the video for this updated blog post. And if you haven’t checked out my Facebook page, Kirby Andersen – Stay On Target, click here and give it a “Like” to stay updated with daily doses of encouragement. Thanks! Great adventures begin with one step. So do great families. Creating a healthy, loving family isn’t complicated yet it does require doing relatively simple things consistently. That’s why I wrote my new ebook, 7 Ways To Supercharge Your Family This Week: Weekly Activities & Culture-Builders That Will Strengthen Your Family For a Lifetime. It’s my gift to you—simply for subscribing to my free email newsletter. I am a family man. I love and am deeply committed to my family—to become the best I can be for them. And I'm committed to you and your family. Nothing gives me greater pleasure than to help others reach for their full potential and hit the mark for which they were created. I live to help others become better versions of themselves at home and work—to not only weather life’s challenges and positively impact their world, but to raise their children to do the same. In short, to live better, love more, and leave a legacy. I now write, speak, and coach full-time. I am married and have three sons and two daughters. 5 Ways To Say, "I'm Thinking Of You." Healthier Eating Made Simple—Really Simple! Enter your name and email address to subscribe to my newsletter and receive my free eBook: 7 Ways To Supercharge Your Family This Week: Weekly Activities & Culture-Builders That Will Strengthen Your Family For a Lifetime.